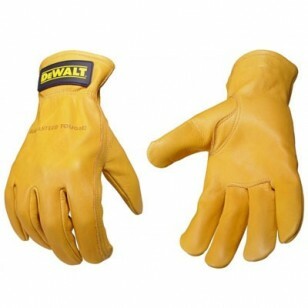 A tough, comfortable, high-quality glove by DeWalt. The goat skin leather makes this glove durable and comfortable. The ToughThread™ double stitching adds durability to the seams of the glove while the keystone thumb provides greater dexterity and comfort. The elastic back offers a secure fit and the premium cowhide is abrasion resistant. This is one of the most comfortable leather drivers glove made!